In the end, all it took was a financial commitment to clean up the metal and net hazards in Redondo Marina. 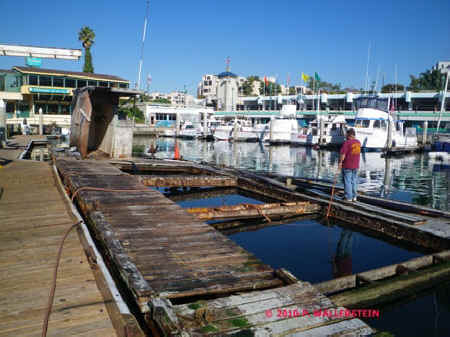 MAR and Redondo Marina are outfitting the barge to be sea lion friendly, providing a safe haul out area for the pinnipeds. Over the years we’ve seen numerous, injured sea lions resting on the jagged, rusty metal of the abandoned bait barge in Redondo Harbor. It was frustrating that there wasn’t anything we could do to help them as they laid on the barge. Attempting to rescue them was impossible without the net snagging on the metal, complicating the rescue and endangering the sea lion and the rescuers. Over the years there have been many unsuccessful attempts to remove the discarded barge. Each time we faced one bureaucratic roadblock after another. 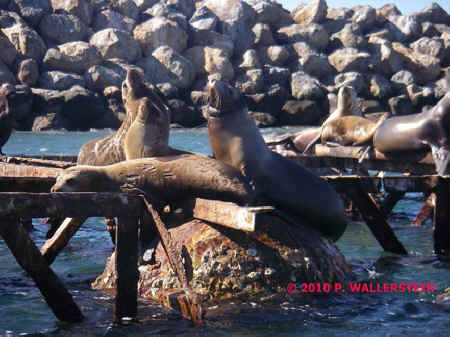 The bait dock, that still is in operation, has also been a location where many sea lions have drowned in the bait wells or have gotten entangled in the nets hanging over the side of the barge. In one incident, we were coming back from a pelican rescue in Redondo Harbor when we observed a thrashing in the water near the bait barge. Upon closer evaluation we observed a young sea lion drowning, entangled in one of the nets. Immediately we took action and minutes later the sea lion was successfully rescued. After the rescue we removed all the discarded nets and lumber with nails protruding from the barge, loaded them on our boat and delivered all the materials to the marina Dockmaster. Now the good news! The rusty barge and all the discarded materials that have caused so many problems over the years, have now been hauled out and tossed the a trash container paid for by Friends of Animals. In the end, all it took was a financial commitment to clean up the metal and net hazards in Redondo Marina. More good news! A major portion of the bait dock that cannot be sunk or removed from the harbor will remain, but will not hold bait for sale anymore. MAR and Redondo Marina are outfitting the barge to be sea lion friendly, providing a safe haul out area for the pinnipeds. We are also making the sanctuary a place where MAR can safely conduct rescue attempts on the injured or sick animals. Work begins on barge to make it sea lion friendly. Caution signs with an educational message shall be displayed around the barge notifying kayakers and boaters to keep their distance and why it’s important to do so. Thanks to Redondo Marina for doing the right thing. Thanks to Redondo Harbor Patrol, Baywatch Redondo and all the individuals who helped make this happen. This is a victory for the sea lions and birds in Redondo Harbor.